This entry was posted on April 2, 2019 by chris elliott. There are many products available to help you to clean your bamboo floor. Once your floor has been installed, you will want to keep it looking its best. Bamboo is easy to look after. Sweeping away any dirt on a daily basis is a starting point. However, you will need to clean your bamboo regularly to remove any marks, scuffs or sticky areas. Using the correct products can really help to bring the shine and freshness back to your bamboo. This mop is the perfect cleaning set. The cleaning solution, which is built into the mop handle, is gentle yet efficient and refillable. The microfibre pad is removable and can be machine washed. Finally, the mop head moves easily and makes light work reaching into corners and tricky areas. 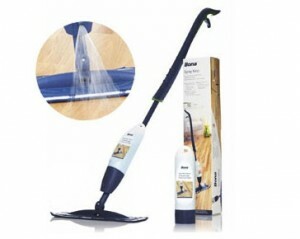 This has a telescopic handle and comes with a selection of three different cleaning pads. A dust mop, to sweep away dust on the surface of your bamboo. A micro-mop to help with cleaning away dirt and stains, and finally an active-fibre cloth which helps to freshen up your bamboo after cleaning. This is the perfect product for refreshing a dull looking bamboo floor. It will bring back the sheen and lustre your bamboo once had. Is there any thing else I can use to clean my bamboo floor? Yes, you can clean your bamboo floor with a damp mop and clean water. You need to be really careful that your mop is fully wrung out. If any excess water is left on the surface of the floor, it could soak in and cause damage to your bamboo. Alternatively, you could use any floor cleaner suitable for wooden floors. Ideally it should be PH neutral and you should only use a soft mop. Maybe have a look at our range of cleaning products. Furniture polish. It can leave a slippery residue which is difficult to remove. Steam mop. The high heat and moisture can penetrate into the planks of your bamboo floor and cause irreparable damage. Acidic or abrasive products. These can scratch or impair the surface lacquer of the bamboo floor. If you would like further tips and advice about cleaning and maintenance for your bamboo floor, please read our Bamboo Flooring Care Guide.